Red: Beetroot, onions (red), peppers (red), radishes, rhubarb, tomatoes, etc. Yellow / Orange: Beetroot (yellow), carrots, peppers (yellow), sweet corn, tomatoes (yellow), etc. White / Tan / Brown: Cauliflower, garlic, ginger, mushrooms, onions, parsnips, etc. Purple: Arparaguas (purple), cabbage (purple), carrots (purple), eggplant, peppers (purple), etc. Green: Artichokes, asparagus, broccoli, Brussels sprouts, celery, cucumber, green beans, green peas, leafy greens (kale, spinach, collards, mustard greens, bok choy, etc), leeks, lettuce, onions (green), peppers (green), sugar snap peas, zucchini, etc. Lower-calorie, lower-starch (carb), and more fibrous kinds of vegetables (as opposed to the higher-calorie, starchier and carb-dense vegetables like potatoes or pumpkin which we consider to be “smart carb” choices on the Sleekgeek Food List instead). Colourful as each colour provides it’s own unique health benefits. Green veggies may get the most popularity, but red, yellow, purple, and even white / tan / brown vegetables are fantastic too. The wider variety of colours you can get in your meals, the better. Most people are already sold on the benefits of eating vegetables, even if it is easier said than done. With that said, we would like to put an emphasis on colourful vegetables. Without adequate colourful vegetable intake, our bodies can’t function well at all and it also makes fat loss, weight maintenance, and muscle gain efforts much more difficult. Vegetables help you feel fuller and stay fuller for longer due to their high volume (from fiber and water content). Vegetables make weight loss and weight maintenance easier by displacing higher-calorie foods and helping you consume less calories in general. Vegetables improve your digestion and help you stay hydrated due to their high fiber and water content. Vegetables help you to avoid nutrient deficiencies, reduce your risk of disease, boost your immune system, lower inflammation, improve recovery and performance, and generally raise your overall level of health due being rich in essential vitamins, minerals, fiber, antioxidants, and phytonutrients. In fact, in our Sleekgeek Coaching Program, the eating vegetables with every meal is the very second nutritional-based habit we teach (after a habit on protein). When it comes to building a healthy meal (such as with the Sleekgeek Healthy Meal Template) we recommend that you start with your protein, then bulk it up with vegetables, and finally build the rest of your meal around that. How many vegetables should you eat per day? Recommended vegetable intake varies from one health authority to the other and from country to country. In the Sleekgeek Coaching Program, we work with the Precision Nutrition certification and guidelines. We find their Fruit and Vegetable Guidelines to be extremely practical and effective, especially combined with easy portion-control guidelines. 1 Serving = roughly 1 Cup. Aim for 5 cups of colourful fruit and vegetables each day (1 cup of greens, 1 cup of reds, 1 cup of oranges, 1 cup of whites, and 1 cup of purples). Ideally, eat more vegetables than fruit. If you opt for fruit, then eat less starchy / smary carbohydrates. 1 Serving of veg is about the size of your fist. 1 Serving of fruit is about the size of your cupped hand. Using measuring cups and scales can be quite laborious and is not necessary for most people. Eating colourful vegetables with every meal is the second nutritional-based habit that we teach in the Sleekgeek Coaching Program. It’s a great anchor habit to keep you on track, help you make healthier meal choices, and fill you up so that you are more satisfied with eating less calorie-dense food. 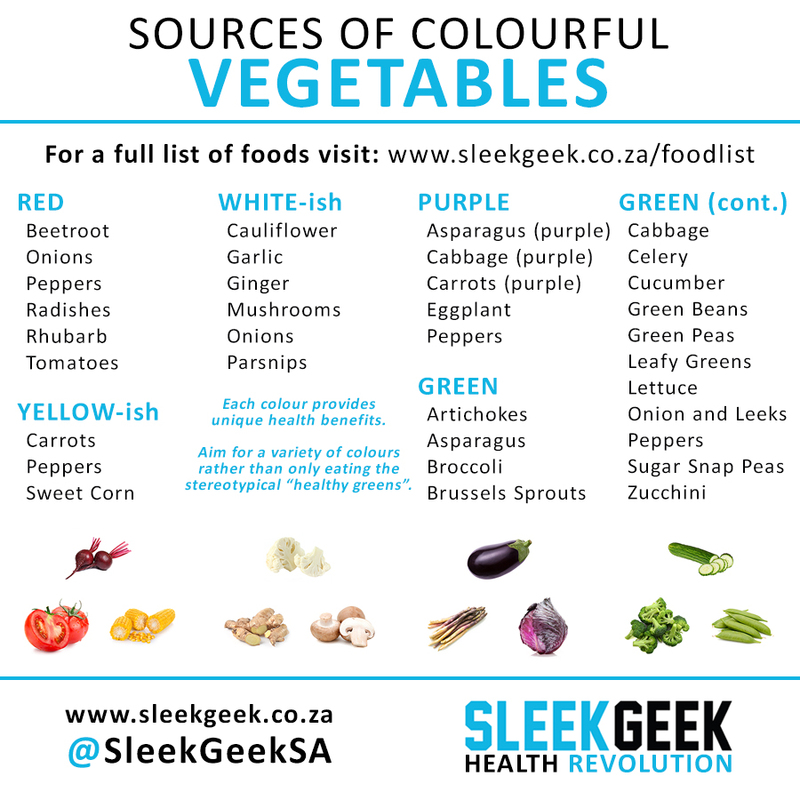 Print out the Colourful Vegetables Food List above or the full Sleekgeek Food List and get to know what colourful vegetables are out there. Stick to easy and convenient colourful vegetables (buy them pre-prepped or pre-cooked if need be). Keep it simple and do-able. Try adding a bit more colourful vegetables to each meal using foods that you actually like and are willing to eat. Work on getting those colourful vegetables in with every single meal, consistently. It’s not a meal if it doesn’t have colourful vegetables! Focus on getting the right amount of colourful vegetables, either using one of the guidelines that we gave above or the Sleekgeek Portion Control Guide. Experiment with different types of colourful vegetables and see if you can expand your variety of choices. Try improving the quality of your colourful vegetables – such as by buying organic and food that has been sourced locally. Don’t forget that colourful vegetables are just one part of your meal. See the Sleekgeek Healthy Meal Template for a broader perspective and work on building up a healthy well-balanced meal. Make sure that you ALWAYS have a handful of go-to colourful vegetables sources on hand that are super easy to prepare and eat when short on time or low on willpower. If you fail to plan then you plan to fail. Vegetables like carrots, cucumber, bell peppers, baby tomatoes, and sugar snap peas are great to keep in your fridge as quick and easy choices when you’re short on time and need something with minimal prep and work. Vegetables like broccoli, cauliflower, beetroot, mushrooms, and eggplant are great to keep in your fridge as versatile staples which can be prepared fairly easily with some quick frying or even microwaving. Vegetables like onions, garlic, ginger, and celery are great to keep in your fridge as powerful flavourants to help you make your meals more interesting. Vegetables like peas, corn, beans, and carrots are great to keep in your freezer as they freeze well and can be quickly called upon if you run out of other fresh veg to use. Frozen veg is just as healthy, if not healthier than fresh veg at times. Getting into the habit of eating colourful vegetables doesn’t need to be complicated or super fancy. It just requires a bit of effort up front, and then a system that you can continuously and regularly maintain. You will come to learn which foods you need to buy frequently and which foods you only need to stock up in bulk once in a while.